Pre-heat the oven to 375˚F. Line a baking sheet with parchment paper. In a medium size bowl, whisk together egg whites, chipotle powder and salt. Add the pumpkin seeds and toss to coat. Spread the seeds in a single layer across the parchment-lined baking sheet and bake for about 15 minutes. Stir them up a bit and pop them back into the oven until golden in color, about 5 minutes more. Taste and season with more salt, if needed. In Recipes-list.com we have selected the most viewed recipes from category - uncategorized . Enjoy the best recipes specially selected for you! 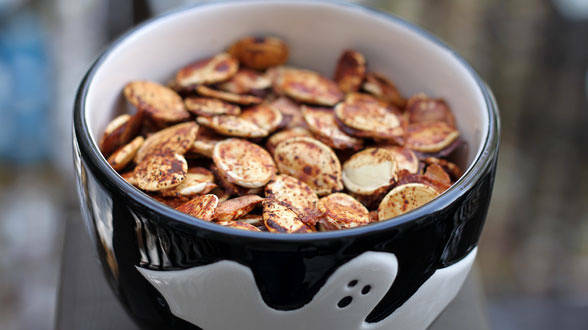 Pumpkin Seed Makeover: Smoky Chipotle Pumpkin Seeds is the right choice that will satisfy all your claims.